As we melt in triple digit heat with no air conditioning in our 100-year-old house, we seek out any remedy to melting completely. This nopales slushie has been one of my best strategies. 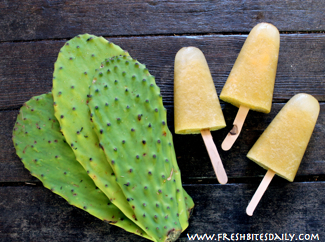 The drink combines nopales (cactus) and any summertime fruit that is available. Peach, orange, and pineapple are our current favorites. Nopales is a popular vegetable in Mexican cuisine — it is the green “leaf” or “paddle” of the cactus known as “nopal” or “prickly pear.” It actually helps to regulate your blood sugar which may be a great thing in this particular recipe that is half fruit. The green portion of the plant is the vegetable and the “prickly pear” is the fruit. The paddle portion is commonly available in Mexican markets or in more general ethnic markets. Simply look in the vegetable section of the store to find them stacked up in a bin. If you buy nopales at the market, it is likely to be fairly well cleaned, but it will always have a few spines remaining. Some spines may appear small and inconsequential. Looks can be deceiving, as you will learn if it ends up as a splinter in your fingers. A larger one fell to our kitchen floor and ended up in my foot. Handle the cactus with care. You can watch our own Half Pints handle the cactus leaf in the video below. For the recipe below, we juiced the nopales with the spines intact. Our juice extractor sends the spines with the pulp to one end and the juice to the other. It was an efficient way to remove the spines. 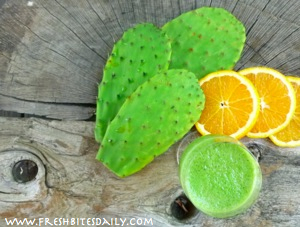 Ideally, you would keep the whole cactus, removing the spines by hand, cutting the cactus in thin slices, freezing it, and popping it in the blender with your favorite fruit. In 100-degree weather, I choose the straightest path from A to B and typically use my juice extractor instead. Two cups of frozen fruit slices or juice frozen in ice cube trays. Blend until smooth, adding a bit more water if the drink is too thick. If you use frozen nopales strips instead of juice, replace some of the frozen fruit with fresh fruit so that the drink will blend more easily. Do not forget your popsicle option: Simply place the mixture in popsicle forms and freeze. 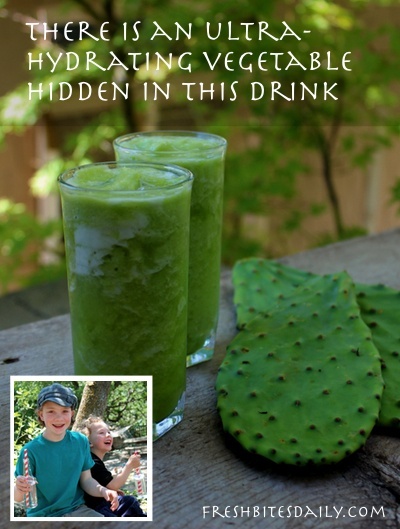 1 Comment on "You won’t believe the hydrating vegetable in this drink (and, no, it’s not cucumber because that would be boring…)"
Wow, I’ve never heard of Nopales before, so thanks for sharing this. I live in freezing cold rainy UK so have the opposite problem trying hard to keep eating fruit while freezing cold. Sorry about your foot. I recently tried to cook globe artichoke for the first time and the thorns in that scared me too. It’s great you thought of juicing it as a solution.